* These thick and square noodles are premium noodles. * Deuchi Udon is one of the representative dishes of Hanil Food and well known for it’s savory and refreshing soup. * Deuchi Seafood udon is also one of the representative dishes of Hanil Food. 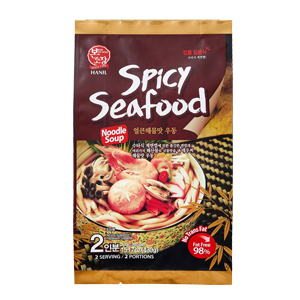 * Enjoy the premium grade noodles with powder soup made from abundant seafood ingredients and vegetable flake. * These thick and square noodles are pre-cooked noodles. * Kimchi is one of the most famous Korean food in the world. * Kimchi flakes made of fermented vegetables makes you feel a great and real Korean meal. * Due to low fat and short cooking time, bowl udon is very popular to everybody who wants healthy and fast meal. * In today’s busy life, you can enjoy the great and delicious Udon for lunch or dinner. Ready only 3 minutes in microwave oven. Try this Kimchi flavor Udon.